3 mil clear, photo safe 13x19 sleeves protect your inkjet or thermal prints from finger marks, moisture or airborne contamination. These Infinity 13" x 19" archival, photo safe sleeves have one sealed side and one flap side. Preserve and protect your inkjet or thermal prints from finger marks, moisture or airborne contamination. 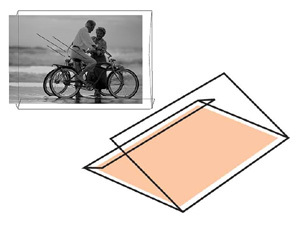 Crystal clear archival polypropylene envelopes make these a great choice for protective storage of traditional or digital output photography. No adhesives are used.